Question. What is the oldest airline in Canada still operating under its original name? The surprise answer is First Air/Bradley Air Services, which celebrates its 70th anniversary in 2016. First Air is working hard to stay current and competitive with fleet and safety enhancements Question. What is the oldest airline in Canada still operating under its original name? First Air is a subsidiary of the Makivik Corporation, founded in 1975 to administer funds paid to the Inuit of northern Quebec as part of the James Bay Hydro Agreement with the Quebec government. It purchased the airline in 1990 from businessman John Jamieson, who bought the airline after the death of founder Russ Bradley. Headquartered in Kuujjuaq, Que., Makivik also owns Air Inuit, which has served Nunavik in northern Quebec since 1978. Based out of Ottawa with hubs in Yellowknife and Iqaluit, First Air operates a fleet of 17 aircraft that until recently, included the only two civilian-owned and operated Hercules cargo aircraft in Canada. They were sold earlier this year. The fleet now consists of two Boeing 737-400 all passenger aircraft, three 737-400 combis, one 737-200 combi, one 737-200 all passenger aircraft and ten ATR 42s. Two ATR 72s were recently sold as well and its only B767-200SF was transferred to partner airline Cargojet in 2014 as part of restructuring efforts. First Air’s scheduled service carries approximately 250,000 passengers and more than 23 million kilograms of freight and mail over its vast and comprehensive route system that includes codeshare destinations, connecting some 30 northern communities with Ottawa, Montreal, Winnipeg and Edmonton. Charter services are also provided worldwide. Interestingly, First Air and Air Inuit serve completely different communities. The only airport they both serve in the north is Kuujjuaq in Nunavik, from where Air Inuit connects smaller Nunavik communities with the First Air 737-400 flights from Montreal and Iqaluit. First Air has close to 1,000 employees with nearly half of them working in the north. The operation contributes more than $50 million annually to Canada’s northern economy and expects to report sales of close to $260 million for 2015. Major maintenance facilities are located in Ottawa, Iqaluit and Yellowknife. 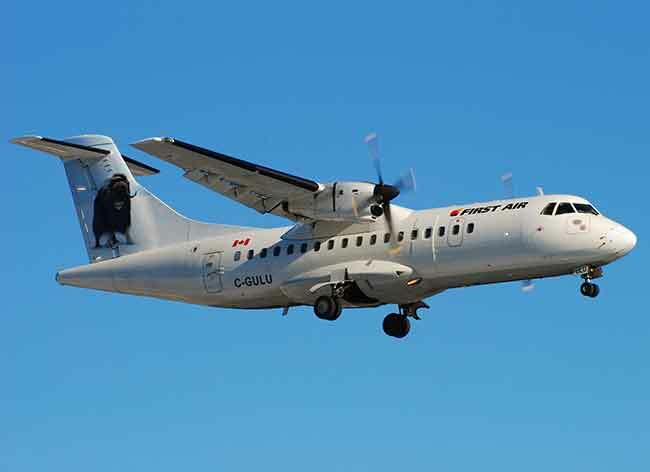 In Ottawa, First Air performs its own ATR C-checks and combi modifications. The airline also offers MRO services to other airlines for ATRs and 737s. First Air has moved on since merger talks broke down last year with Canadian North. They’ve made a number of announcements, including a codeshare agreement with Canadian North and Calm Air and an expanded cooperation agreement with overnight air cargo operator Cargojet which carries more than a million pounds of cargo each business night to locations across North America. First Air expects more cargo from Cargojet’s points of contact on First Air flights from Canada Post, UPS and online retailers. Currently, there isn’t a lot of cargo going south from the north, but the new agreement with Cargojet could change that too, such as fresh Arctic Char from Pangnirtung on Baffin Island being shipped all over the world via Ottawa. “Unfortunately the merger between First Air and Canadian North didn’t work out,” said Brock Friesen, president and CEO of First Air. “The fit would have been good. We’re largely a scheduled carrier and their core business is charters.” First Air instead implemented Plan B: Dispose heavily loss making routes, replace unprofitable services with codeshares, sell unique aircraft types and replace with partnerships where required. While First Air pulled out of some routes such as Repulse Bay due to heavy losses, codeshare agreements allow the airline to continue serving the routes through partners. The new codeshare agreements with Canadian North and Calm Air were implemented in July this year. This will help reduce costs, allows the airline to benefit from efficiencies, improved flight schedules and better connections for passengers and cargo. In addition, the codeshare agreements will allow more nonstop flights on certain routes such as Pond Inlet. Departures are spread out during the day, instead of wing tip to wing tip flying. and poor infrastructure in the north comes into the equation. And this past summer, Iqaluit, a major hub for First Air from Ottawa, Winnipeg and Montreal, was dogged by rain, clouds and fog. Despite the challenges posed by weather, First Air’s on-time performance is pretty consistent in winter Tattuinee noted. It’s fog in spring and fall that causes more headaches. “We’ll delay as long as possible, before cancelling a flight outright,” he said. It’s not unusual for First Air to carry less cargo between July-August when there is an alternative service from the shipping industry. But during the winter, it will transport everything from cars and snowmobiles to mattresses and sofas, in addition to urgently needed food supplies and medicine. Because of the growth in traffic in recent years, due to mining projects such as Baffinland Iron Mines, the Iqaluit airport feels it needs a new terminal, which is expected to be completed in the spring of 2017. In addition to a new airport building, the project includes expanded aprons, new lighting systems, an upgraded runway and a new combined services building that will house the fire-fighting vehicles/support equipment and the heavy equipment that maintain the runways and aprons. “We very much welcome investment that improves the safety and reliability of our operations such as lightning and navigational aids,” said Bert van der Stege, vice-president of commercial at First Air. His role is to restructure the airline and monitor all ground services. “However, I’m not such a big fan of expensive new glass palaces.” That was his response in reference to the new terminal building and extra costs for airlines. 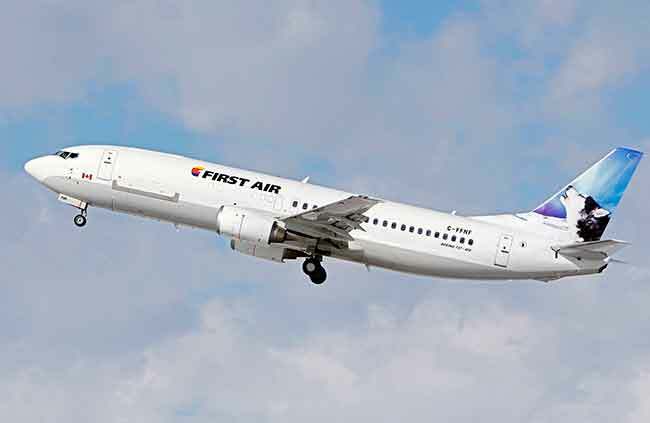 First Air is undergoing its own upgrades with an impressive fleet renewal initiative, a major cost-cutting program, service enhancement project and improved revenue management department with better forecasting of supply and demand. The ATR 42-300s are being replaced by the 500s series and the 737-200s are being replaced by 737-400s. One all passenger 737-400 jet is also currently being converted into a combi aircraft. Seating in that aircraft will be reduced from 135 to 72 seats to accommodate more cargo. In 2013, the company brought in Friesen as its new president and CEO and van der Stege as his vice-president, both with one objective: to turn around the airline. Friesen, 66, is ex-Canadian Airlines and has also worked for Air Canada and the Star Alliance. van der Stege, 37, had already spent 17 years in the airline industry, most of which at Lufthansa where he started as a management trainee. At Lufthansa Consulting, he was part of the start-up team at Etihad Airways and managed restructuring projects with Garuda, Philippine Airlines, Tarom and Air Madagascar. In addition, he developed change management projects for Aegean, EgyptAir and Kuwait Airlines. 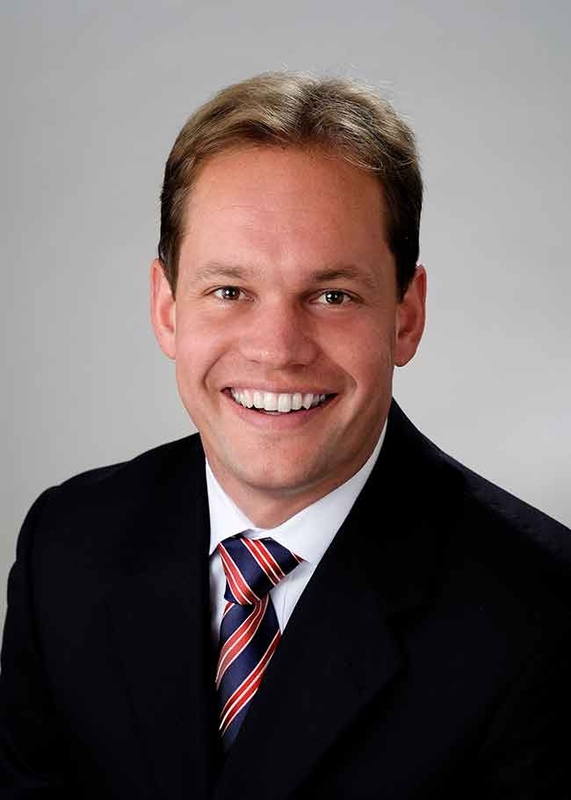 Prior to joining First Air, van der Stege was commercial director at RwandAir where he was instrumental in the development of this fast growing African airline into a hub-and-spoke carrier with new Boeing and Bombardier aircraft. At First Air his focus is different. First Air still operates two old B737-200s for gravel runways and is expecting to retire those by the end of 2016. Another B737-400 combi will be added in December 2015, its third in the fleet. In January 2016, it plans to add a further B737-400 all passenger aircraft. And while the fleet restructuring is in full swing, Hercules are no longer in the fleet. One was bought by Lynden Air Cargo of Anchorage, Alaska, which will operate Hercules flights on behalf of First Air, on an as needed basis. “They were just too expensive to operate and maintain ourselves,” van der Stege said. Asked to revisit the failed merger with Canadian North, van der Stege said consolidation among northern airlines is inevitable. “Mergers are always complicated, so a codeshare agreement was the best solution.” Several airlines and routes are struggling with high costs, low traffic volumes and a very challenging infrastructure. Dropping of routes, such as First Air did to Repulse Bay in 2014, remains a real possibility unless a merger, codeshare agreement or other form of cooperation can be worked out. 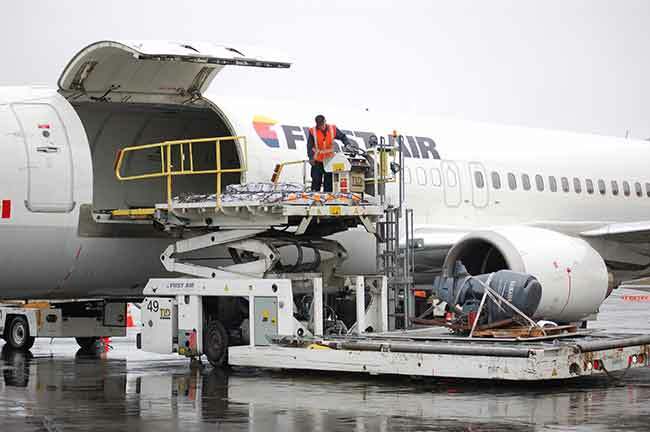 And based on the assumption First Air expects to turn a profit in 2015 after several years of losses, the codeshare agreements with Canadian North and Calm Air and an expanded cooperation agreement with cargo operator Cargojet will undoubtedly play a major role in achieving that goal.